Research in the Biomaterials for Regenerative Therapies group is devoted to the development and knowledge transfer to industry of innovative biomaterials and scaffolds for tissue regeneration. We design, fabricate and characterize bioactive and biodegradable materials and investigate their interactions with biological entities, both in terms of their fundamental aspects and with specific applications for tissue engineering purposes in mind. The aim is the repair and functional restoration of tissues or organs by means of 3D scaffolds, cells and signals. The production of structured bioactive nanocomposites that can enhance vascularization, bone and skin regeneration, either by electrospinning, rapid prototyping or micro-particles production. Following the projects awarded by a CAIXAIMPULSE first edition project to bring our “Dermoglass” project to a closer commercialization stage and within the IBEC-LaCaixa Joint program, we continued to develop new nanoparticles that have an antimicrobial effect to add this property to the dressing. This project also obtained an award by EIT Health PoC to enhance IP protection (patent submitted) and scalability for further commercialization. During this year, we started in vivo studies in large animal models with very promising results. In collaboration with Prof. Kevin Healy at Berkeley, we focused in the fabrication of customized biomaterials and/or microfluidics based platforms for the fundamental study of biological systems related to angiogenesis processes. We have used signalling gradients of concentration to address progenitor cells to the desired target. Following the project MATRICELL (awarded by MINECO), we started a new line of research on the production of microtissues that can be further processed to obtain new bioinks to print organs such as bone, and produce models for pathologies like cancer. In this line, we have started a collaboration with Prof. Alberto Muñoz (Ciberonc) in order to develop models to study colon cancer progression and the role of vitamin D. Moreover, these microtissues can be created inside a bioreactor, which can be used to decellullarize and recellularize them with the appropriate cells, and can be controlled by means of bioluminescence. Microtissues have been used as a Glioma tumor therapy (collaboration with Prof. J. Blanco, IQAC). Another new line of research of the group is the development of instructive matrices to activate cardiac cells to promote cardiac regeneration. Several works with industry and clinicians started during 2017: an industrial collaboration with Avinent Implant System S.L., a Barcelona-based company that is an internationally recognized reference in dental implantology and medical devices for fixing or replacing bone. The project aims to produce 3D-printed bioactive substitutes to develop a new model for 3D printing applications for bones in the maxillofacial region. With Dr. Velez at the Vall d’Hebron Hospital, we have developed a synthetic periosteum to enhance vascularization and bone formation. We are new members of the Red de Terapia Celular (Tercel) to collaborate with the cell therapy groups in tissue and organ regeneration. These equipment and services constitute unit U5 of NANBIOSIS, the integrated infrastructure for the production and characterization of nanomaterials, biomaterials and systems in biomedicine, of CIBER-BBN and the Minimal Invasion Surgery Center Jesús Usón, which has been recognized by Spanish Government as Unique Scientific-Technological Infrastructure (ICTS). Pronto magazine reported on IBEC’s 3D bioprinting capabilities and, in particular, the collaboration of the company AVINENT S.L. and the institute to carry out a research project to print personalized bone structures using 3D technology. La Vanguardia reported on the collaboration of the company AVINENT S.L. and IBEC to carry out a research project to print personalized bone structures using 3D technology. IBEC’s Biomaterials for Regenerative Therapies group has published a review of the state-of-the-art in biomaterials for skin healing that proposes a move towards more personalized, in situ therapies. Betevé’s “Deuwatts” programme devoted to biomedical engineering, they featured interviews with Elisabeth Engel and Sergi Rey. Biomaterials for Regenerative Therapies PhD student Jesús Ordoño will spend six months at Michigan State University with a Daniel Bravo scholarship. In a further step forward in their quest to achieve functional biomaterials for tissue regeneration, IBEC’s Biomaterials for Regenerative Therapies group has revealed a new construct that enhances blood vessel formation and maturation in vivo. Yesterday and today IBEC has been exhibiting at the Coventry Life Festival in the UK, a celebration of active ageing which is taking place in the university town not far from Birmingham. IBEC’s Biomaterials for Regenerative Therapies group leader Elisabeth Engel was one of five scientific guests to take part in a round table session at yesterday’s annual general assembly of Barcelona Global at the PRBB. IBEC researchers have laid the groundwork for faster advances in 3D bioprinting for regenerative medicine by creating a system of ink and matrices that offers a solid basis for tissue regeneration. This week IBEC is taking part in the Youth Mobile Festival (YOMO) of the Mobile World Congress, the world’s largest gathering for the mobile industry, with an interactive stand about bioengineering for cardiac regeneration. This week IBEC director Josep Samitier, group leaders Elisabeth Engel, Xavier Trepat and Pere Roca-Cusachs, and Ester Sánchez, representing the Strategic Initiatives Unit, are in Singapore to take part in the first IBEC-MBI Joint Symposium, which took place on 26th September. This month IBEC is taking part in the Barcelona International Youth Science Challenge (BIYSC 2016), a new initiative that aims to stimulate scientific talent among young people from all over the world. IBEC researchers have published a paper in Nanoscale elucidating a brand new biomaterial that paves the way towards a fourth generation of effective structures for tissue regeneration. Oscar Castaño, a senior researcher in IBEC’s Biomaterials for Regenerative Therapies group, has been awarded the CIBER-BBN YSF in Biomaterials prize for 2012-2014. Miguel Angel Mateos from the Biomaterials for Regenerative Therapies group was interviewed for Televisió L’Hospitalet after his participation in this year’s Setmana de la Ciència, for which he gave a talk entitled “Regeneració de teixits : com nou” at the Centre Cultural Sant Josep on Wednesday. Josep A. Planell, rector of the UOC and Research Fellow at IBEC, appears in a new documentary about technology transfer in Catalonia, Inversió de Futur. The Biomaterials for Regenerative Therapies group has appeared on science programme ‘El problema de Gettier’. Junior group leader Elisabeth Engel talks about the group’s development of a tuned implant that could aid the regeneration of brain tissue, particularly in cases of pre- and postnatal injury. At Friday 28th March’s official ceremony for the 2013 round of RecerCaixa funding, IBEC junior group leader Elisabeth Engel will represent all the winners and centres as the investigator chosen to speak at the event. Tissue regeneration researchers at IBEC, UB and the UPC have developed an implant that could aid the regeneration of brain tissue, particularly in cases of pre- and postnatal injury. Awards will support researchers’ work on a system to aid rehabilitation in children, and improved healing in shoulder injuries. Follow the media coverage of the Dermoglass crowdfunding project in the IBEC in the Media section of the web. IBEC crowdfunding project now accepting donations! IBEC’s very first venture into crowdfunding, which has come about as an initiative of the Biomaterials for Regenerative Therapies group, goes live today on the crowdfunding website www.goteo.org. Josep A. Planell, founding director of IBEC, was presented with the European Society of Biomaterials’ prestigious George Winter prize at their annual conference held in Madrid on Tuesday. IBEC researchers have come up with a groundbreaking new approach to create a tough, biodegradable, bioactive and entirely new material, heralding a major milestone in the production of artificial matrices for tissue engineering. 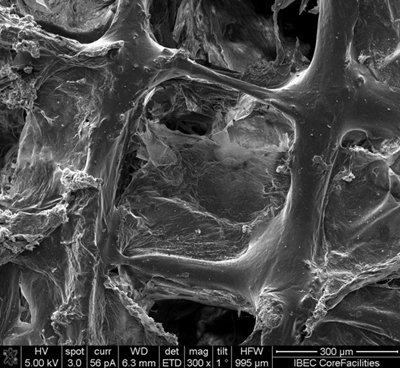 In a letter published today in the Royal Society journal Interface, the Biomaterials for Regenerative Therapies group describes a new, easy and cheap method for producing glass-coated fibrous scaffolds which not only faithfully mimic the extracellular matrix of bone, but also aim to direct stem cell fate through physical and chemical interactions. Researchers from IBEC and the University of Barcelona have revealed a promising new strategy for regenerating the central nervous system, in a paper published in the journal Biomaterials. IBEC researchers have stuck tissue engineering gold with the creation of a new ‘smart’ biomaterial that triggers angiogenesis by providing the biochemical and mechanical cues needed for the process to begin. We’ve all eaten rich meals or fatty foods and joked that we can feel our ‘arteries hardening’. However, the reality of atherosclerosis – when fat, cholesterol, and other substances build up in the artery walls and form solid structures called plaques – is no joking matter. The consequences of this disorder can include stroke and coronary artery disease, the leading cause of death in many developed countries. The two IBEC-led CIBER-BBN tissue regeneration projects that were earmarked for funding by the EU’s ERA-NET EuroNanoMed initiative last year (see www.ibecbarcelona.eu/IBEC-News/funding-success-for-two-ibec-projects.html) have both received the national support they need to get started. IBEC director Josep Planell’s research group has changed its name and is now known as the Biomaterials for Regenerative Therapies group. In the beautiful surroundings of Academy House on Rambla dels Estudis last night, IBEC director Josep Planell was elected as Academician of the Royal Academy of Science and Arts of Barcelona (RACAB). The lucky winners of the Image of the Year 2010 competition received their prizes today. An announcement on www.noticiascadadia.com about 20 October’s Biocat-organised meeting on ‘Biomateriales: de la biónica hacia la regeneración y las terapias avanzadas’ at the Museo Colet in Barcelona. Josep Planell, Director of the Institute for Bioengineering of Catalonia, explains his work on tissue regeneration at the nanoscale. El passat 16 de setembre, el diari El Mundo, dins el seu suplement de Biotecnologia, va publicar una entrevista a Josep A. Planell, director de l’IBEC. This study investigated the metabolic requirements for neuronal progenitor maintenance in vitro and in vivo by examining the metabolic adaptations that support neuronal progenitors and neural stem cells (NSCs) in their undifferentiated state. We demonstrate that neuronal progenitors are strictly dependent on lactate metabolism, while glucose induces their neuronal differentiation. Lactate signaling is not by itself capable of maintaining the progenitor phenotype. The consequences of lactate metabolism include increased mitochondrial and oxidative metabolism, with a strict reliance on cataplerosis through the mitochondrial phosphoenolpyruvate carboxykinase (PEPCK-M) pathway to support anabolic functions, such as the production of extracellular matrix. In vivo, lactate maintains/induces populations of postnatal neuronal progenitors/NSCs in a PEPCK-M-dependent manner. Taken together, our data demonstrate that, lactate alone or together with other physical/biochemical cues maintain NSCs/progenitors with a metabolic signature that is classically found in tissues with high anabolic capacity. Major limitations of calcium phosphate cements (CPCs) are their relatively slow degradation rate and the lack of macropores allowing the ingrowth of bone tissue. The development of self-setting cement foams has been proposed as a suitable strategy to overcome these limitations. In previous work we developed a gelatine-based hydroxyapatite foam (G-foam), which exhibited good injectability and cohesion, interconnected porosity and good biocompatibility in vitro. In the present study we evaluated the in vivo performance of the G-foam. Furthermore, we investigated whether enrichment of the foam with soybean extract (SG-foam) increased its bioactivity. G-foam, SG-foam and non-foamed CPC were implanted in a critical-size bone defect in the distal femoral condyle of New Zealand white rabbits. Bone formation and degradation of the materials were investigated after 4, 12 and 20 weeks using histological and biomechanical methods. The foams maintained their macroporosity after injection and setting in vivo. Compared to non-foamed CPC, cellular degradation of the foams was considerably increased and accompanied by new bone formation. The additional functionalization with soybean extract in the SG-foam slightly reduced the degradation rate and positively influenced bone formation in the defect. Furthermore, both foams exhibited excellent biocompatibility, implying that these novel materials may be promising for clinical application in non-loaded bone defects. Recent studies have pointed towards a decisive role of inflammation in triggering tissue repair and regeneration, while at the same time it is accepted that an exacerbated inflammatory response may lead to rejection of an implant. Within this context, understanding and having the capacity to regulate the inflammatory response elicited by 3-D scaffolds aimed for tissue regeneration is crucial. This work reports on the analysis of the cytokine profile of human monocytes/macrophages in contact with biodegradable 3-D scaffolds with different surface properties, architecture and controlled pore geometry, fabricated by 3-D printing technology. Fabrication processes were optimized to create four different 3-D platforms based on polylactic acid (PLA), PLA/calcium phosphate glass or chitosan. Cytokine secretion and cell morphology of human peripheral blood monocytes allowed to differentiate on the different matrices were analyzed. While all scaffolds supported monocyte/macrophage adhesion and stimulated cytokine production, striking differences between PLA-based and chitosan scaffolds were found, with chitosan eliciting increased secretion of tumor necrosis factor (TNF)-Î±, while PLA-based scaffolds induced higher production of interleukin (IL)-6, IL-12/23 and IL-10. Even though the material itself induced the biggest differences, the scaffold geometry also impacted on TNF-Î± and IL-12/23 production, with chitosan scaffolds having larger pores and wider angles leading to a higher secretion of these pro-inflammatory cytokines. These findings strengthen the appropriateness of these 3-D platforms to study modulation of macrophage responses by specific parameters (chemistry, topography, scaffold architecture). Osteoporosis is a worldwide disease with a very high prevalence in humans older than 50. The main clinical consequences are bone fractures, which often lead to patient disability or even death. A number of commercial biomaterials are currently used to treat osteoporotic bone fractures, but most of these have not been specifically designed for that purpose. Many drug- or cell-loaded biomaterials have been proposed in research laboratories, but very few have received approval for commercial use. In order to analyze this scenario and propose alternatives to overcome it, the Spanish and European Network of Excellence for the Prevention and Treatment of Osteoporotic Fractures, "Ageing", was created. This network integrates three communities, e.g. clinicians, materials scientists and industrial advisors, tackling the same problem from three different points of view. Keeping in mind the premise "living longer, living better", this commentary is the result of the thoughts, proposals and conclusions obtained after one year working in the framework of this network. An alternative approach to bone repair for less invasive surgical techniques, involves the development of biomaterials directly injectable into the injury sites and able to replicate a spatially organized platform with features of bone tissue. Here, the preparation and characterization of an innovative injectable bone analogue made of calcium deficient hydroxyapatite and foamed gelatin is presented. The biopolymer features and the cement self-setting reaction were investigated by rheological analysis. The porous architecture, the evolution of surface morphology and the grains dimension were analyzed with electron microscopy (SEM/ESEM/TEM). The physico-chemical properties were characterized by X-ray diffraction and FTIR analysis. Moreover, an injection test was carried out to prove the positive effect of gelatin on the flow ensuing that cement is fully injectable. The cement mechanical properties are adequate to function as temporary substrate for bone tissue regeneration. Furthermore, MG63 cells and bone marrow-derived human mesenchymal stem cells (hMSCs) were able to migrate and proliferate inside the pores, and hMSCs differentiated to the osteoblastic phenotype. The results are paving the way for an injectable bone substitute with properties that mimic natural bone tissue allowing the successful use as bone filler for craniofacial and orthopedic reconstructions in regenerative medicine. Calcium phosphate cements (CPCs) were meant to produce hydroxyapatite (HA), which is the calcium phosphate that usually results when the cements are mixed with or immersed in aqueous media. The golden age of CPCs was in the late 1990s and the beginning of the 21st century, when they were presented as promising bone substitutes and drug delivery systems. The different reactions that take part in the cement self-setting process depend on many experimental factors – the composition of the cement, the stability of the different components, pH, liquid-to-powder ratio (LPR), and temperature, among others. CPCs have demonstrated fair efficiency for bone regeneration. Cements have gradually been embraced in the wider field of composites by hybridizing their compositions in order that they may adapt to the new trends. Fabrication of new biodegradable scaffolds that guide and stimulate tissue regeneration is still a major issue in tissue engineering approaches. 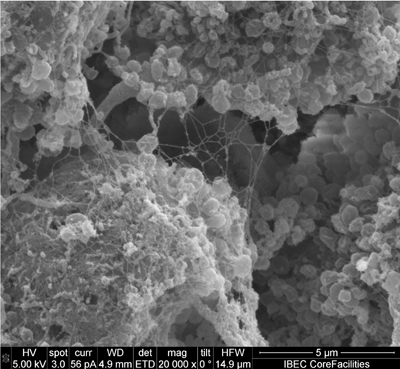 Scaffolds that possess adequate biodegradability, pore size, interconnectivity, bioactivity and mechanical properties in accordance with the injured tissue are required. This work aimed to develop and characterize three-dimensional (3-D) scaffolds that fulfill the aforementioned requirements. For this, a nozzle-based rapid prototyping system was used to combine polylactic acid and a bioactive CaP glass to fabricate 3-D biodegradable scaffolds with two patterns (orthogonal and displaced double layer). Scanning electron microscopy and micro-computer tomography showed that 3-D scaffolds had completely interconnected porosity, uniform distribution of the glass particles, and a controlled and repetitive architecture. Surface properties were also assessed, showing that the incorporation of glass particles increased both the roughness and the hydrophilicity of the scaffolds. Mechanical tests indicated that compression strength is dependent on the scaffold geometry and the presence of glass. Preliminary cell response was studied with primary mesenchymal stem cells (MSC) and revealed that CaP glass improved cell adhesion. Overall, the results showed the suitability of the technique/materials combination to develop 3-D porous scaffolds and their initial biocompatibility, both being valuable characteristics for tissue engineering applications. The aim of the present work was to analyze the influence of the setting reaction on the injectability of tricalcium phosphate (TCP) pastes. Even if the injection was performed early after mixing powder and liquid, powder reactivity was shown to play a significant role in the injectability of TCP pastes. Significant differences were observed between the injection behavior of non-hardening Î²-TCP pastes and that of self-hardening Î±-TCP pastes. The differences were more marked at low liquid-to-powder ratios, using fine powders and injecting through thin needles. Î±-TCP was, in general, less injectable than Î²-TCP and required higher injection loads. Moreover, clogging was identified as a mechanism hindering or even preventing injectability, different and clearly distinguishable from the filter-pressing phenomenon. Î±-TCP pastes presented transient clogging episodes, which were not observed in Î²-TCP pastes with equivalent particle size distribution. Different parameters affecting powder reactivity were also shown to affect paste injectability. Thus, whereas powder calcination resulted in an increased injectability due to lower particle reactivity, the addition of setting accelerants, such as hydroxyapatite nanoparticles, tended to reduce the injectability of the TCP pastes, especially if adjoined simultaneously with a Na2HPO4 solution. Although, as a general trend, faster-setting pastes were less injectable, some exceptions to this rule were found. For example, whereas in the absence of setting accelerants fine TCP powders were more injectable than the coarse ones, in spite of their shorter setting times, this trend was inverted when setting accelerants were added, and coarse powders were more injectable than the fine ones. Rapid prototyping (RP), also known as additive manufacturing (AM), has been well received and adopted in the biomedical field. The capacity of this family of techniques to fabricate customized 3D structures with complex geometries and excellent reproducibility has revolutionized implantology and regenerative medicine. In particular, nozzle-based systems allow the fabrication of high-resolution polylactic acid (PLA) structures that are of interest in regenerative medicine. These 3D structures find interesting applications in the regenerative medicine field where promising applications including biodegradable templates for tissue regeneration purposes, 3D in vitro platforms for studying cell response to different scaffolds conditions and for drug screening are considered among others. Scaffolds functionality depends not only on the fabrication technique, but also on the material used to build the 3D structure, the geometry and inner architecture of the structure, and the final surface properties. All being crucial parameters affecting scaffolds success. This Commentary emphasizes the importance of these parameters in scaffolds’ fabrication and also draws the attention toward the versatility of these PLA scaffolds as a potential tool in regenerative medicine and other medical fields. Moving forward in the short term, we hope to see the Impact Factor of the Journal continue its upward trajectory as a measure of service to our readers. Toward that end we will continue our efforts to increase the visibility of the journal, which will be achieved through a number of approaches. Further details will be announced at the ESB meeting this summer. We plan to encourage a series of high profile reviews, and will continue to strive to reduce the processing time for papers. We have upgraded our reviewer database and are grateful to those people who have already updated their profiles in the new electronic system. This facilitates our search for suitable reviewers, by expertise, and helps to speed up the whole process in a number of ways which benefit both reviewers and authors Longer term, our goal is to be the journal of choice for leading biomaterials scientists in Europe, the USA and across the world for both speed and quality of publication. We would especially like to take this opportunity to thank you for your continued support of the journal. Nanofibrous structures developed by electrospinning technology provide attractive extracellular matrix conditions for the anchorage, migration, and differentiation of tissue cells, including those responsible for the regeneration of hard tissues. Together with the ease of set up and cost-effectiveness, the possibility to produce nanofibers with a wide range of compositions and morphologies is the merit of electrospinning. Significant efforts have exploited the development of bone regenerative nanofibers, which includes tailoring of composite/hybrid compositions that are bone mimicking and the surface functionalization such as mineralization. Moreover, by utilizing bioactive molecules such as adhesive proteins, growth factors, and chemical drugs, in concert with the nanofibrous matrices, it is possible to provide artificial materials with improved cellular responses and therapeutic efficacy. These studies have mainly focused on the regulation of stem cell behaviors for use in regenerative medicine and tissue engineering. While there are some challenges in achieving controllable delivery of bioactive molecules and complex-shaped three-dimensional scaffolds for tissue engineering, the electrospun nanofibrous matrices can still have a beneficial impact in the area of hard-tissue regeneration. PLA MPs are prepared via a novel and toxic-chemical-free fabrication route using ethyl lactate, a green solvent and FDA-approved aroma. MPs are obtained by a solution jet break-up and solvent displacement method. Adjusting flow parameters allows the tuning of MPs size between 60 and 180 µm, with reduced polydispersity. Morphological analysis shows microporous particles with Janus-like surface. A fluorophore is successfully loaded into the MPs during their formation step. This versatile green solvent-based procedure is proven to be suitable for drug encapsulation and delivery applications. The method may be extended to different droplet generation techniques. Controlling the fate of implanted hMSCs is one of the major drawbacks to be overcome to realize tissue engineering strategies. In particular, the effect of the inflammatory environment on hMSCs behaviour is poorly understood. Studying and mimicking the inflammatory process in vitro is a very complex and challenging task that involves multiple variables. This research addressed the questions using in vitro co-cultures of primary derived hMSCs together with human peripheral blood mononucleated cells (PBMCs); the latter are key agents in the inflammatory process. This work explored the in vitro phenotypic changes of hMSCs in co-culture direct contact with monocytes and lymphocytes isolated from blood using both basal and osteogenic medium. Our findings indicated that hMSCs maintained their undifferentiated phenotype and pluripotency despite the contact with PBMCs. Moreover, hMSCs demonstrated increased proliferation and were able to differentiate specifically down the osteogenic lineage pathway. Providing significant crucial evidence to support the hypothesis that inflammation and host defence mechanisms could be utilised rather than avoided and combated to provide for the successful therapeutic application of stem cell therapies. Alpha-tricalcium-phosphate-based bone cements hydrolyze and set, producing calcium-deficient hydroxyapatite. They can result in an effective solution for bone defect reconstruction due to their biocompatibility, bioactivity and adaptation to shape and bone defect sizes, together with an excellent contact between bone and graft. Moreover, the integration of hydrogel phase based on poly(vinyl alcohol) (PVA) to H-cem–composed of α-tricalcium phosphate (98% wt) and hydroxyapatite (2% wt)–allows improving the mechanical and biological properties of the cement. The aim of this work was to evaluate the influence of the PVA on relevant properties for the final use of the injectable bone substitute, such as setting, hardening, injectability and in vivo behaviour. It was shown that by using PVA it is possible to modulate the setting and hardening properties: large increase in injectability time (1 h) in relation with the plain cement (few minutes) was achieved. Moreover, in vivo tests confirmed the ability of the composite to enhance bone healing in trabecular tissue. Histological results from critical size defects produced in rabbit distal femoral condyles showed after 12 weeks implantation a greater deposition of new tissue on bone–composite interfaces in comparison to bone–cement interfaces. The quality of bone growth was confirmed through histomorphometric and microhardness analysis. Bone formation in the composite implantation sites was significantly higher than in H-cem implants at both times of evaluation. An understanding of protein adsorption process is crucial for designing biomaterial surfaces. In this work, with the use of a quartz-crystal microbalance with dissipation monitoring, we researched the following: (a) the kinetics of adsorption on TiO2 surfaces of three extensively described proteins that are relevant for metallic implant integration [i.e., albumin (BSA), fibrinogen (Fbg), and fibronectin (Fn)]; and (b) the competition of those proteins for adsorbing on TiO2 in a two-step experiment consisted of sequentially exposing the surfaces to different monoprotein solutions. Each protein showed a different process of adsorption and properties of the adlayer-calculated using the Voigt model. The competition experiments showed that BSA displaced larger proteins such as Fn and Fbg when BSA was introduced as the second protein in the system, whereas the larger proteins laid on top of BSA forming an adsorbed protein bi-layer when those were introduced secondly in the system. Electrospinning is one of the most versatile and effective tools to produce nanostructured fibers in the biomedical science fields. 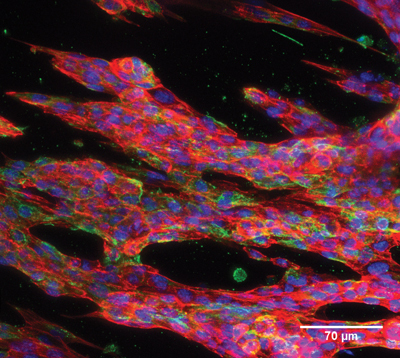 The nanofibrous structure with diameters from tens to hundreds of nanometers largely mimics the native extracellular matrix (ECM) of many tissues. Thus far, a range of compositions including polymers and ceramics and their composites/hybrids have been successfully applied for generating electrospun nanofibers. Different processing tools in electrospinning set-ups and assemblies are currently developed to tune the morphology and properties of nanofibers. Herein, we demonstrate the electrospinning process and the electrospun biomaterials for specific use in tissue regeneration with some examples, involving different material combinations and fiber morphologies. Prof. Andrés J. García, F.B.S.E.